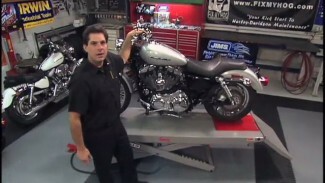 In this video Bob walks us through the installation of this kit on a 1200 Sportster. 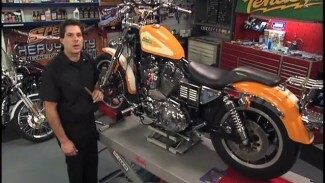 This is a really cool addition to any Touring, Dyna or Sportster model Harley Davidson. The install is straightforward, but there is some planning you will need to do before getting started. As always, Bob reminds us how important it is to reference your year and model specific service manual. The Arnott kit comes with explicit instructions and all hardware that you will need is included in this complete kit. Always begin with opening and laying out everything supplied in the kit. Confirm that everything listed for your kit is present. Also, confirm that you have all of the tools you will need to complete the job. You do not want to be half of the way through an install only to find that you do not have a vital component or tool. Find the locations for your compressor and air manifold. Verify that there will be adequate clearance; not only from moving components, but also from hot surfaces. The same applies for the air lines and wires. Be confident that the air lines and all wiring can be routed safely. Avoiding hot surfaces and sharp edges is a must for rider safety and longevity of the assembly. Start by disconnecting your battery and jacking your rear tire. Remove your conventional shock absorbers. 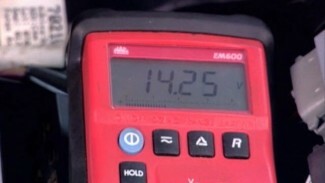 Install your new air shocks and tighten to factory torque specs found in your service manual. Mount your compressor and position it so that it has plenty of clearance and will not hinder any function of your motorcycle. Assemble your air manifold and mount it in a secure location, as well. We also show you how-to run your air lines, secure them with tie wraps and trim the lines to the necessary length. Pay close attention to the correct orientation of the air fittings. The threaded ferrel and tapered sealing collet are shipped with a nylon pin. The pin is for shipping purposes and to hold the two pieces in their correct orientation for your reference. The tapered side of the collet will face towards the threaded side of the ferrel. It is important to leave your battery disconnected while you mount your switch and wire the assembly. The instructions have a clear, detailed wiring diagram. Even if you have little, or no experience with DC voltage/wiring; you will easily be able to understand and follow the supplied diagram.